If you want to hear Bach’s keyboard concertos played on the piano, rather than the harpsichord, you have a good choice of exponents. The likes of Glenn Gould, Murray Perahia and Angela Hewitt are the main choices. In the case of Handel — using the anglicised form of his surname — the situation is nowhere near the same, given that the main body of solo concertos by Bach’s contemporary and compatriot, are essentially organ concertos. 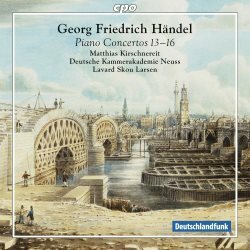 In 2013, the German CPO label produced its first volume of Handel ‘Piano Concertos’, or as it identifies them, ‘Die Orgelkonzerte op. 4 Nr.1-6 in der Version für Klavier & Orchester’ – with Matthias Kirschnereit and the Deutsche Kammerakademie Neuss (777 837-2). In its accompanying note CPO suggests that the ‘21st century is just the right time to introduce these original organ works played on a modern concert-grand’. On this present follow-up CD, the same team tackles another four organ concertos, this time to include the familiar ‘Cuckoo and the Nightingale’ concerto, No. 13. Whether there’s any more reason to produce piano versions of Handel’s concertos than Bach’s cannot simply be answered by trying to discover what these two composers respectively knew about the successor to the harpsichord. Initially this was the fortepiano which was evolving around 1700, and subsequently there was Cristofori’s piano proper. Bach’s concertos are clearly for harpsichord, while Handel’s are for organ. Kirschnereit addresses this very issue in his ‘Remarks from the artist’, which is a preamble to the sleeve-notes proper by Ulf Brenken, headed: ‘Organ Works on the Piano?’ Kirschnereit quotes all the usual arguments – would Handel or Bach have preferred to write for the piano if it were available to them? Personally I’m sure they would have, in much the same way that both composers would have delighted in the facility to notate their extensive repertoire – and then produce all the instrumental parts at the touch of a button, using a modern-day notation programme on a computer. Obviously that's preferable to laboriously writing everything out by hand, often in dim light which later robbed both composers of their eyesight in old age. Just as Bach didn’t write his concertos for a pedal harpsichord, which would have meant some additional transcription problems when transferred to a single keyboard piano, Handel’s organ concertos are conveniently written to involve just the manuals. Thus again a direct transcription offers no real difficulties. However, there are two slightly aggravating things in Kirschnereit’s article justifying the use of the piano here. Firstly, he does rather like to state the obvious. Secondly his English is very much of the Denglish variety, when compared with Brenken’s highly-informative notes on the works recorded. These have at least been translated from the original German by Susan Marie Praeder. Sentences like the following really don’t enhance the credibility of the task in hand, and in fact rather let the side down: ‘It thus seems to me (Kirschnereit) that the bold idea to perform Handel’s organ concertos on the modern Steinway has the potential to display in a different light a number of the artistic ideas slumbering in these scores.’ ‘The organ functions differently than a grand piano – here we reiterate this obvious fact!’ ‘Handel’s organ concertos on the piano: a thrilling challenge that, all scruples and doubts aside about how I might I transfer these scores to the Steinway, in the end brought the orchestra and me very great joy!’ CPO is after all an otherwise highly-regarded record label. Yes, the piano, with its touch-sensitive keyboard, the facility to produce a cantabile (singing) tone and easy balance and delineation between lines, is a completely different animal from the organ. However it’s never been a secret that organists and pianists are not simply interchangeable and neither are their respective instruments. A good deal of re-learning, adjustment and accommodation to the significant differences between the two keyboard instruments has to be made, approaching from either direction. It’s probably best not to bother with Kirschnereit’s preamble – except for just two comments: firstly about the absence of pedals, and secondly one reminding us that Handel usually improvised during the performance, using the written score merely as a guide. Here Kirschnereit intimates that he’ll be doing exactly the same thing during the performance – so no surprise there either. Just put the CD on, let it play and make up your own mind whether the classical music world has been immeasurably poorer because Handel’s organ concertos have hitherto been heard only on their intended instrument. Kirschnereit mentions that the Concerto Op. 4 No. 6 on his earlier CD is often played in a version either for organ or for harp, Also consider whether the use of a modern Steinway makes a truly significant difference to the music itself, notwithstanding the obvious difference in timbre, dynamic range and percussive nature, which does enable it to cut through the string texture with greater ease. There is no doubt that Kirschnereit’s playing is first rate – highly articulate, expressive, but never for any mere 19th-century romantic excess. His ornamentation is still totally idiomatic and appropriate. The orchestral accompaniment is equally fine, and the recording quality excellent. Even when played on a conventional CD-player, the sound is outstanding and no doubt will sound even better on a dedicated SACD device. If you like Handel’s instrumental music – with its busy and bouncy fast movements, and expressive but never onerous or drawn-out slow movements – this CD could still be of interest. The pitch is today’s current A440, rather than the slightly-lower Baroque standard. Whereas there is a valid reason for Handel’s Harpsichord Suites to be readily available to pianists as a significant additional source of Baroque keyboard music, frankly Bach’s Piano Concertos probably provide enough material for piano and string orchestra already. These Handel stable-mates really seem of little more than mere novelty value.